Home » Internet » What Does "Om Telolet Om" Mean? Here’s the Answer! What Does "Om Telolet Om" Mean? Here’s the Answer! [KampungAndroid.com] - Om Telolet Om is a sentence appeal or the cries of people devoted to the bus driver. Interest said "Om Tolelot Om" is that the bus driver honking unique and interesting. As the name suggests, the sound of the bus horn was sounded "telolet - telolet - telolet". From the wording of that emerging trends "Telolet Om Om" in Indonesia. 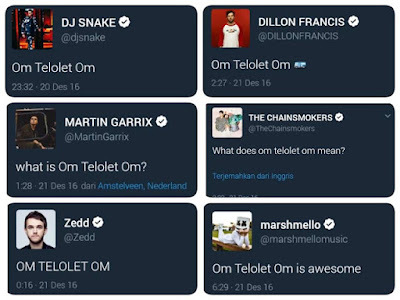 "Om Telolet Om" become trending topic on Facebook, Instagram, and Twitter. Many people talking about it in Social Media. Om telotet om is just Indonesian joke. It is started by school boys who run after the bus and yell "Om Telolet Om" means "Uncle, ‘telolet’ please" asking for the bus driver to honk the horn. But lately, Om Telolet Om become viral. Om Telolet Om now followed by many people, then come to social media, like Twitter. Maaf, fasilitas komentar untuk What Does "Om Telolet Om" Mean? Here’s the Answer! ditutup untuk sementara. Pertanyaan, saran atau kritik silakan buka halaman Kontak.